If you think cosmetic surgery is just about vanity and ego, think again! Dr. Joe "Love that Face" Niamtu, the king of the plastic knife variety, says it's also about helping victims of domestic violence regain their composure, getting post-divorce singles their confidence back and helping youth avoid bullying. Children with protruding ears, for instance, might need a little pin back. It's a simple procedure that Dr. Joe usually recommends at age 5, before kids enter the cruel world of kindergarten. In a blog post on his website, he explains the varying taunts relayed to him by younger patients: "Your ears are so big you can hear the sunset. Your ears look like a Volkswagen with the doors open. You look like Dumbo." Hear, here, to fighting the good fight, Dr. Joe. 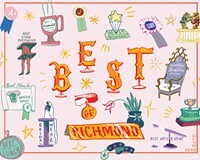 Dr. Mason Williams founded Richmond Plastic Surgeons — whose slogan is "more than just a face" — and has been practicing in Richmond since 1986. Dr. Neil Zemmel also is well known — he worked a bit in South Beach — and has an office in Midlothian. In addition to serving as director of facial plastic and reconstructive surgery in the department of otolaryngology-head and neck surgery at VCU Medical Center, Dr. Michael Godin has a private practice on Libbie Avenue.